Early this month, I wrote about the menu for the Big Lunch. Many people showed interests in attending or reading about the event for consideration for future years. One major factor that stopped some people was that they claimed they wanted a reasonable price. For $140 per person, I admit that the ticket price was not low but if you continue to read this post, I am sure you will find the price to be better than “reasonable”. Considering the amount of courses as well as the high quality of food and the fact that all proceedings go to charity, the event is definitely worth attending in future years. Hay, we are dining for a cause! The Big Lunch is an annual event that focus on raising funds for homeless people and people in needs across Australia. 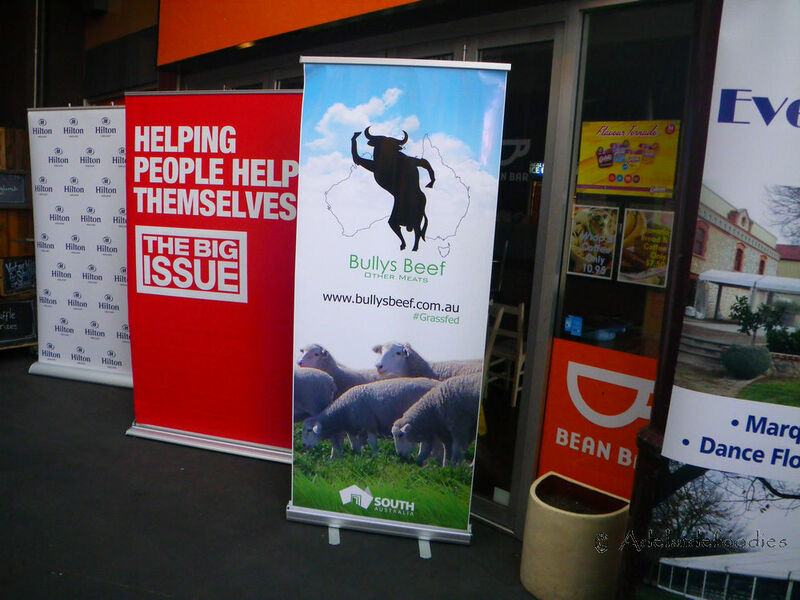 The event is run by the Big Issue and being in its fourth year, the lunch received numerous amount of media and government attentions as well as interests from the general public. 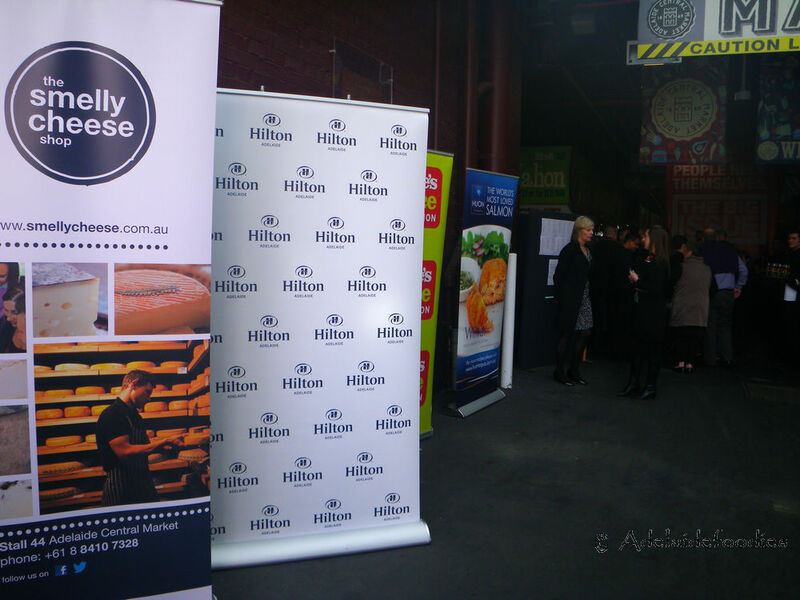 Hilton Adelaide has been on board catering for the event and Simon Bryant was there last year to cook for the diners. 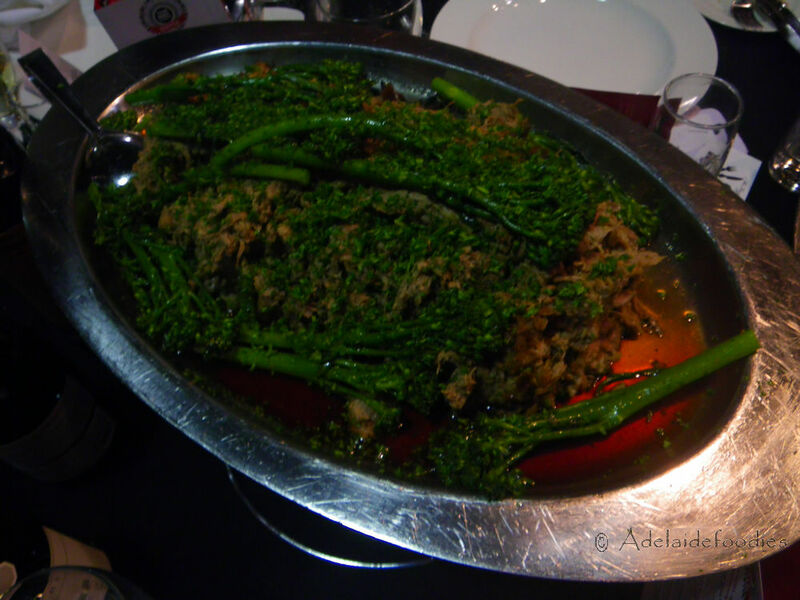 In 2014, the lunch was taken place in the world acclaimed Adelaide Central Market on Sunday, July 28 with approximately 350 people attending the event. Hilton’s team cooked some delicious and hearty food using local South Australian produce while Maggie Beer also contributed a recipe, which made me a bit excited event before going to the event. There are other local businesses which sponsored the lunch and with all these amazing South Australian produce, I was very sure it was going to be a great time. Running from 11:30 am to 3 pm, the Big Lunch attracted people from all aspects of lives, from politicians and media to ordinary people like you and me. We were definitely dining for a cause at this time of the year. Tina and I arrived at 11:25 am and the heat was already on. My fellow blogger friend, Dougal McFuzzlebutt and My Kitchen Rule winner Bree May were there as well as several other familiar faces. 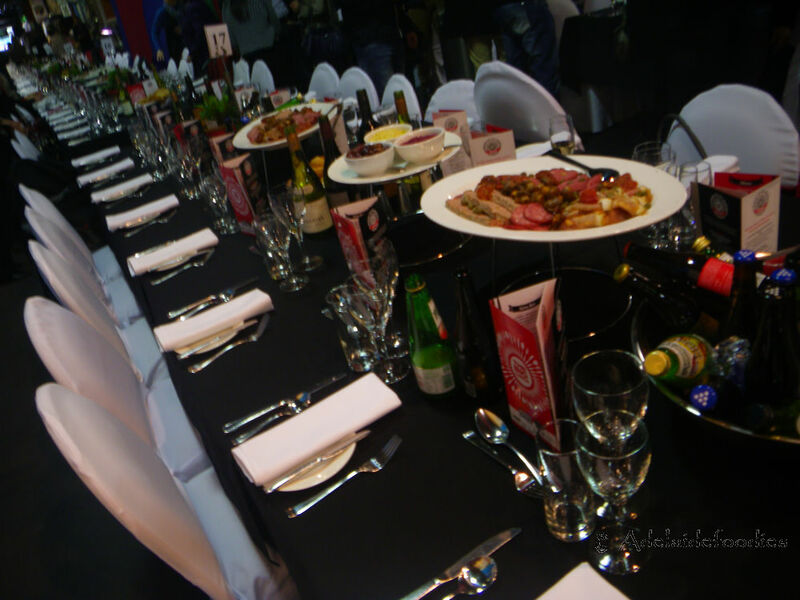 After a couple of drinks, all guests started approaching to their tables and got seated. 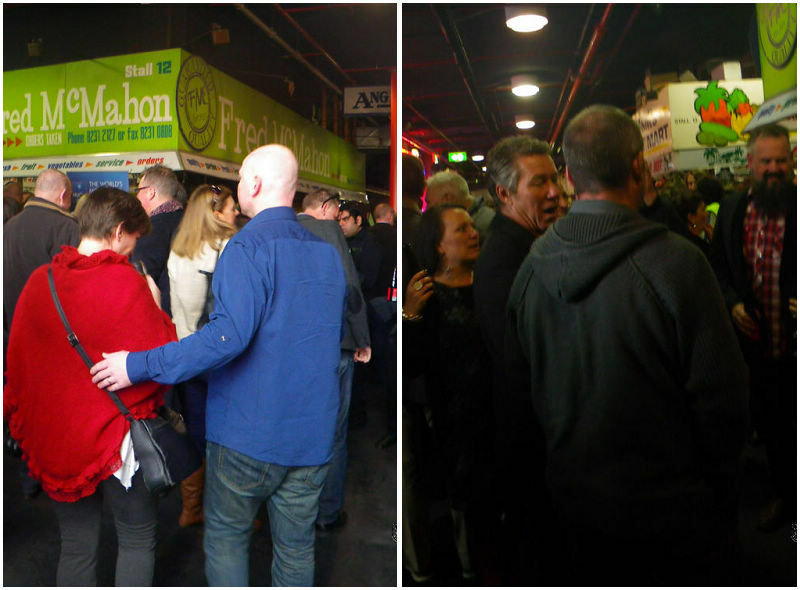 Can you imagine 35 tables like the following being placed from one end of Adelaide Central Market to the other? Seriously, it was the biggest lunch I’ve ever seen. Straight onto the food – I have to admit that the quality of the food exceeded my expectation; from Chacuterie to dessert, no single bite disappointed me. Let me take you through my food journey at the lunch and maybe one or two dishes can inspire you :). 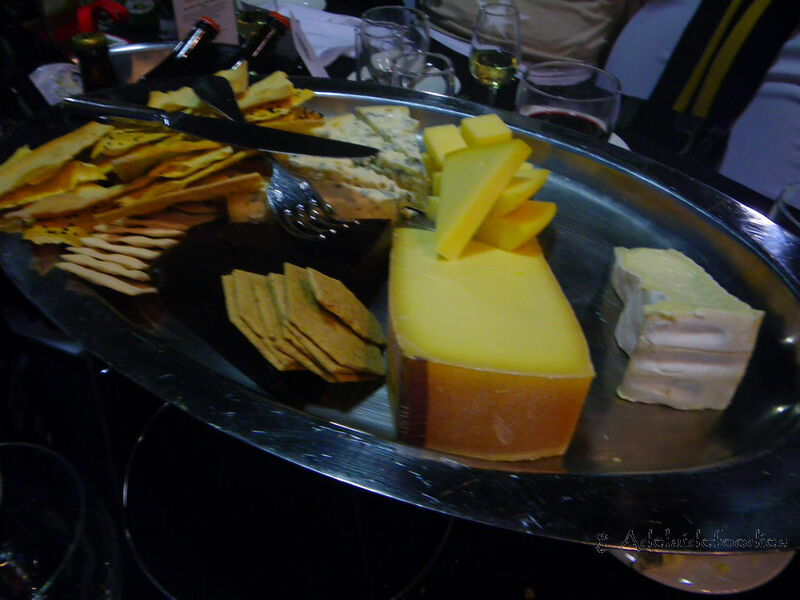 The chacuterie plate was provided by one of my most preferred smallgoods producer, Barossa Fine Foods. The highlights of the plate were the prosciutto, the smoked wagyu and the terrine. The prosciutto was a very good choice and exhibited a hint of the tastes from curing. While having a soft texture, the mouthfeel was absolutely great for this product. It also showed layers of flavours on the palate and combined well with the mushroom. I’ve written about their smoked wagyu before and this one was exactly the same as the ones I used for lunch sandwiches. The level of smokiness was moderate while the meat was flavoursome. The terrine was very soft with refined texture and went straight down my throat. With the amount of spices and herbs added, this product is a must for many chacuterie plates. Good choices that the Big Lunch committee have selected! The entrees quickly arrived while the first round of raffle tickets started selling. The organiser has put a lot of effort into the lunch. There were silent auctions which featured many local artists’ works while small edible plants were up for grabs on each tables. Entrees were served in two options. As a foodie, I definitely should taste both of them, shouldn’t I?! 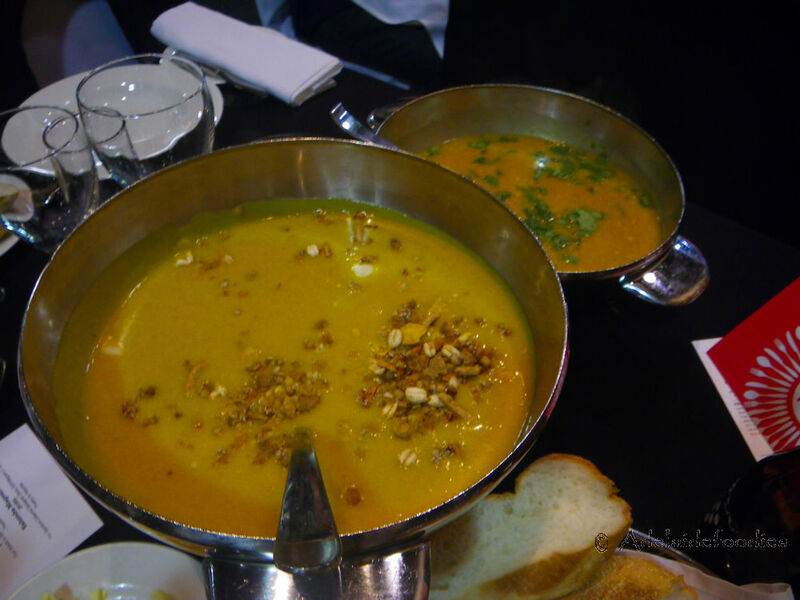 Roasted butternut and pear bisque with granola – This is not your ordinary pumpkin soup. The soup was full of aromas on the nose. The soup was not as thick as the normal pumpkin soup we make at home and this dissoluteness helped the spread of the flavours. If you like spices or curry, to be accurate, this is the type of soup never to be missed. The addition of granola, in fact, introduced some crunchiness into the soup and made that “wow” factor. Vegas free range chicken ‘mulligatawny’ – Mulligatawny is a typical Anglo-Indian cuisine and is widely enjoyed in this community in the UK, Australia and India. Although it supposed to be a spicy dish, I found it to be mild to moderately spicy. The sweet and sour flavour of the soup made all the chacuterie pieces digested well and fully enhanced my appetite. The chicken was broken into small pieces and was extremely smooth in the soup. If you get a chance, this is a must try dish. Recommended! 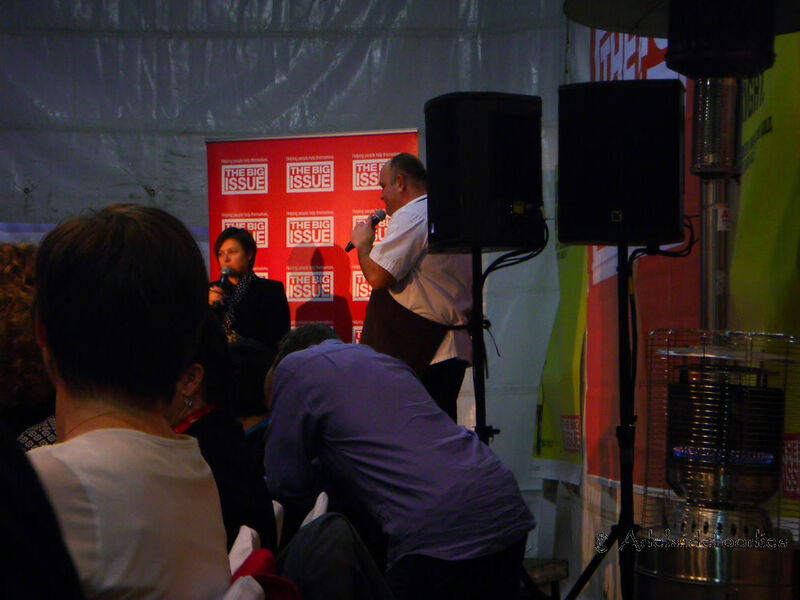 After the entrees, the organiser arranged one of the Big Issue vendor to share his story and life in Australia. It was great to see people who used to receive charity now contribute to the society. Isn’t this one of the true Australian value? Our mains arrived after the little interview with three dishes, each of which were carefully prepared to a high standard to cater for all dietary requirement. This was my favourite dish of the day! The lamb was cooked to just perfection with well balanced taste. The lamb meat was pulled into small pieces and was easy to cut. The texture of the meat was very soft and silky and went down to the stomach in a flash. Although the dish looked a bit watery, the juices from the meat was well maintained and made the dining experience very interesting! This hearty dish is a must to try – Maggie Beer is surely not disappointing you! In terms of the taste, the lamb flavour has been well promoted with the preserved lemon. The meat, as being slow cooked, was tender and moist and a hint of spiciness was experienced while tasting the lamb. Lamb shoulders are not so easy to cook but the Hilton Adelaide team has definitely done a brilliant job. Although my photo was not that great for this dish, the actual taste worth dying for. The salmon was provided my Huon, one of my preferred salmon producers. The charred salmon was full of oil – don’t get me wrong though, it’s not oily. The fish was full of the omega 3 within its flesh and one can actually taste the difference. The salmon was cooked to perfection with the flakes can be separated easily by fork without destroying the original shape of the fish and the oil shined on each individual flake. The taste of the fish was brilliant as all the fresh salmon flavours were fully penetrated onto the palate after the first bite. The flesh of the fish was possibly one of the best salmon I’ve had. They were as extremely soft and tender without any dryness. 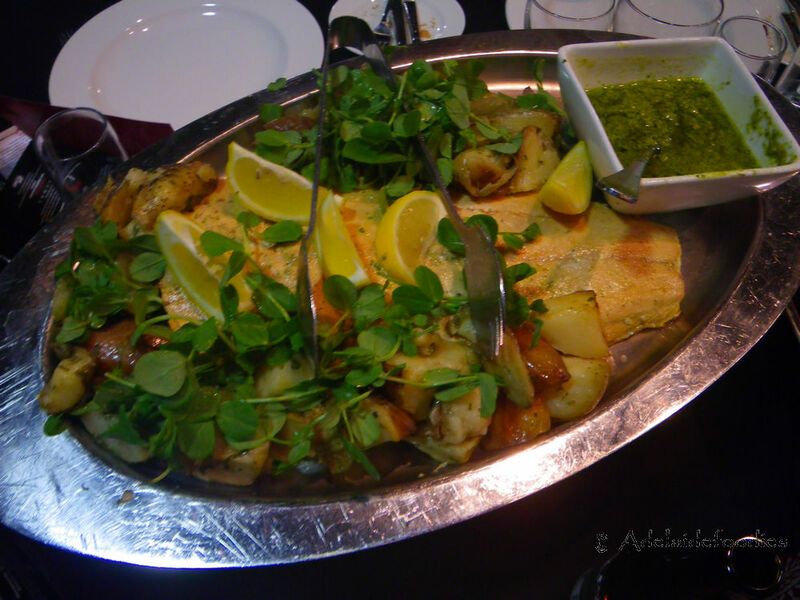 The sides fully promoted the fish’s taste and the potato enhanced the texture of the dish as a whole. Well done! Beef wellington? No – It’s vegetable wellington. The organiser has been very considerable and the lunch definitely catered for every dietary requirement. The wellington was very crispy on the outside with the inside being potato, carrot and other seasonal veggies. 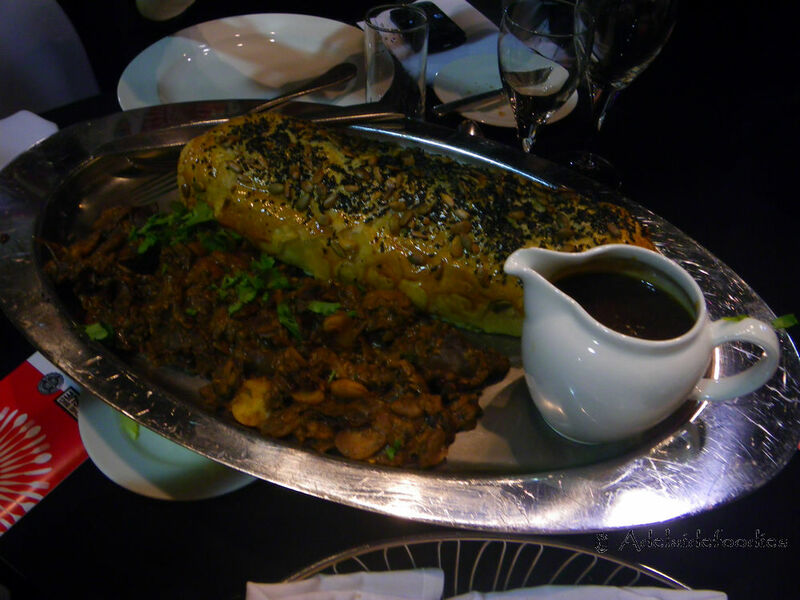 The mushroom was done well and especially complemented with the addition of the vegan “gravy”, it was sensational and I could even taste a hint of butter in the wellington. A good choice for vegetarians. If you think the food has already made the diners full, I can tell you that our journey did not end here. There were two desserts and a cheese platter which came after the main courses. During the break between courses, Hilton Adelaide’s executive chef, Lloyd Cremer talked about his philosophy on preparing for the lunch and drew all the raffle ticket entrees. It was such a fun time too! 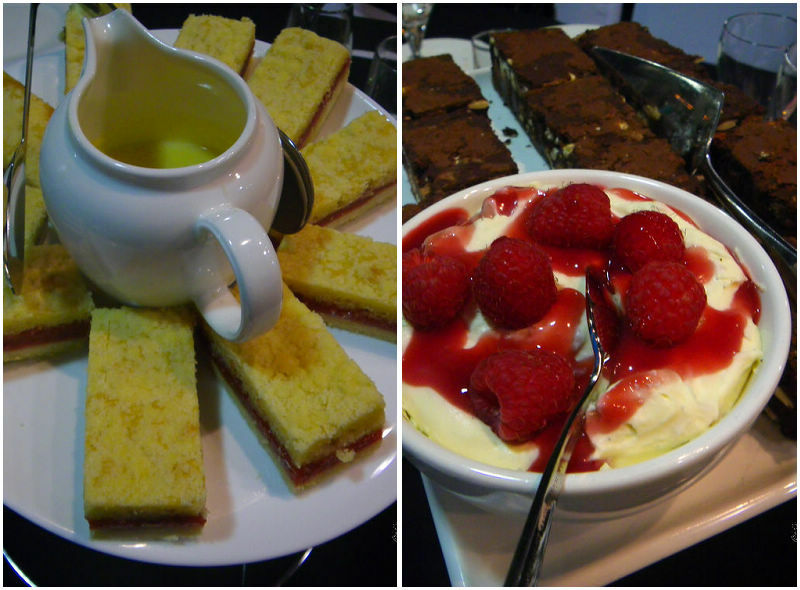 Both of the desserts were very yummy. They were not so sweet but were very tasty. The chocolate brownie exhibited some bitterness as well as strong chocolate fragrances in the mouth. The raspberry creme added some extra sweet fruity factors, which made the whole dessert refreshing! The rhubarb and frangipane tart on the left was also very delicious with crunchy tart and a slight bitter and sweet center. These desserts were definitely brilliant enough to please a picky dessert critic. In Australia, we tend to help people who are in need and I truly think the Big Lunch is one of the best events in Adelaide that shows their continuous fun-raising activities for these people. Many homeless and disadvantaged South Australians have obtained assistance through the not for profit organisation by distributing and selling the fortnightly street magazine, The Big Issue. There are currently around 50 The Big Issue vendors in South Australia with over 500 vendors nationally. 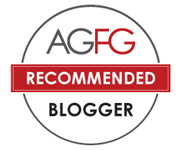 From my dining experience, foodies, you can see how good the quality is for food. With all these fantastic local South Australian producers contributing and the involvement of Hilton Adelaide, the Big Lunch surely is a place to be if you want to enjoy quality lunch as well as donating to people on charity to make Adelaide a better place to live for homeless and disadvantaged people. Let’s all dining for a cause! Are you planning to go to next year’s event? Check out their website for more details in future. 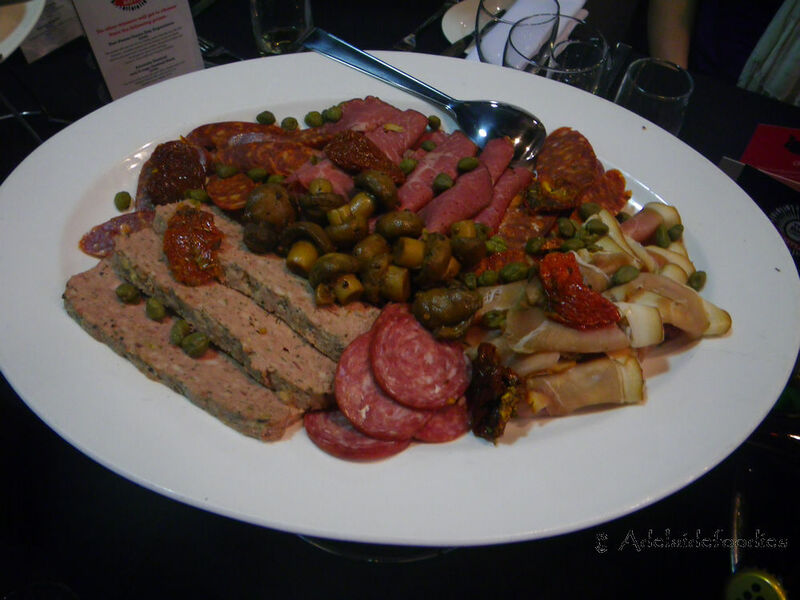 Coming up on Adelaidefoodies is my recent dining experience at Republic Norwood for their weekly suckling pig dinner. Until next post, enjoy :)! I was expecting to read this post. The food looked yum although the price is a bit high for a new accountant like me. We’ve been there last year and yeah, it was a great fun with friends and of course, dining while donating to the charity. Couldn’t make it this year and we are looking forward to attending next year. Great review btw! G’day! Looks like a fun event Xin with great food for a great cause! Glad you enjoyed!